Up to the mid-nineteenth century Italy was not a united sovereign nation but a patchwork of small independent states, each influenced to a greater or lesser degree by neighbouring powers such as France or Austria. A unification movement (Risorgimento) took hold in the 1850s, however, and included among its leaders Giuseppe Garibaldi and Giuseppe Mazzini. Key to their aims was the annexation of the Papal States, a territory situated like a wide belt across the middle of the Italian peninsula. With no viable military force to protect his lands, an increasingly worried Pope Pius IX issued a call to Catholics throughout Europe for men and arms to raise an army in his defence. By March 1860, papal emissaries had arrived in Dublin to negotiate the sending of an Irish battalion to Italy. At the forefront of this recruitment drive was an alliance between Count Charles McDonnell of Vienna, a ‘chamberlain’ to the pope, and Alexander Martin Sullivan, editor of The Nation. Within a matter of weeks, the recruitment committee had organised rallies in support of the pope’s plight throughout the country and over £80,000 was collected, most of it channelled to the Vatican through the Irish Pontifical College in Rome. The call to arms that emanated from St Peter’s Square was echoed in sermons from pulpits the length and breadth of the country. Religion was not the sole motivating factor, however. Anti-British feeling was another, spurred on by vocal anti-papal elements within the British establishment. In a concerted effort to destabilise French and Austrian influence among the Italian states, Lord Palmerston’s government in Westminster openly supported the reunification movement, aiding Garibaldi’s invasion of southern Italy with the British navy. Furthermore, in response to the success of the Catholic Church’s recruitment campaign in Ireland, the British authorities passed the Foreign Enlistment Act, which prohibited British subjects from joining a foreign army. Not that this acted as a deterrent. Whatever Britain opposed, Irish nationalists were prone to support, as another common rallying cry of the day demonstrated—‘Mallacht Dé ar an mbanrion [God curse the queen], it’ll be the pope for me’. These papal volunteers came from all walks of life—labourers, farmers, lawyers and doctors. Mr J.A. Parker and Mr Denis McSweeney from Cork, responsible for recruiting volunteers from the south of Ireland, wrote to Rome praising the twenty members of the Cork constabulary who resigned their posts and gave up good salaries to join the cause. The opposition of the governing British authorities necessitated shrewd manoeuvring by the estimated 1,400 Irishmen who journeyed to Italy. Many resorted to travelling in groups of 20–40, accompanied by priests and calling themselves pilgrims, emigrants or workmen. 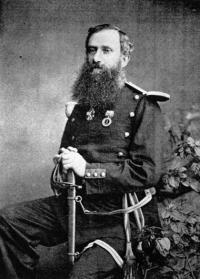 Above: Major Myles O’Reilly (1825–80)—in command of the Irish unit, newly christened the Battalion of St Patrick. By late June 1860, the majority of the Irish battalion had gathered in Italy to begin a rushed form of training in the company of volunteers from nine further nationalities. To make matters more difficult, English was not among the three languages adopted by the papal army. In command of the Irish unit, newly christened the Battalion of St Patrick, was County Louth native Major Myles O’Reilly. In overall command of the papal army was General Louis Christophe Leon Juchault de Lamoricière, a Frenchman, considered to be one of the finest soldiers in Europe and recently returned from active service in Algeria with the French Foreign Legion. Despite the quality of their commanders, the recently arrived Irish found the military organisation of this hastily convened army to be shambolic. With no military source for arms and uniforms, the Irish were poorly clothed, worse than any other nationality serving in the papal army. They were issued with surplus Austrian uniforms, leftovers from previous wars, and weaponry that consisted of obsolete smooth-bore muskets. The green uniforms, promised months before in Ireland, never arrived. This was a source of particular disappointment to the men, as they had no external sign of their nationality. Furthermore, the Irish battalion never served together as a unit but was split into companies, assigned to defend papal land in separate key locations. While a few hundred disgruntled individuals decided to return to Dublin, the Irish fighting spirit came to the fore amongst the thousand or so who remained committed to the cause. General Lamoricière, who was not slow to criticise slack units in his cobbled-together army, always spoke highly of his Irish recruits. Forces from the kingdom of Piedmont-Sardinia crossed into the Papal States on 11 September 1860, but the resistance put up by Lamoricière to the invaders was largely nominal. 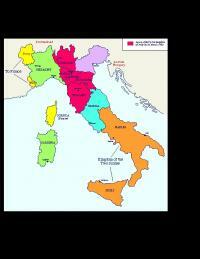 There was, however, sharp fighting against the Piedmontese in a number of areas where the Irish companies were posted. Beginning on 13 September in Perugia, one company, under the command of Captain James Blackney, went into action. This initial engagement was little more than running street skirmishes followed by the quick capitulation of the papal force’s Austrian commander. In fact, the only resistance put up to the Italians was from a small group of Irish, led by Patrick Clooney of Waterford. Fighting tenaciously among the narrow streets and refusing to surrender, Clooney’s small band was finally forced to make a stand in an abandoned house. After inflicting serious casualties on the Piedmontese, the weight of numbers and the arrival of artillery eventually compelled the Irish to lay down their arms. As was to become a pattern in this conflict, some nationalities in the pope’s army were more likely to accept early terms of surrender. This charge would not be laid against O’Reilly’s men. The engagement at Spoleto four days later was an entirely different and bloodier affair. Two companies (over 300 Irish volunteers) under their battalion commander, Major Myles O’Reilly, again fought tenaciously against 2,500 veteran Piedmontese, including Victor Emmanuel’s infamous Bersaglieri. Given the task of protecting the North Wall and the vital Gate House of the majestic Castle Albornozian, the Irish performed with distinction, holding their ground and the gate for fourteen hours despite some heavy hand-to-hand fighting and under constant bombardment from General Brigonne’s field artillery. After withstanding repeated attacks, Major O’Reilly eventually negotiated a favourable surrender when the possibility of reinforcement had become unlikely. Captain Kirwan later recorded ‘losing 32 men between killed, prisoners and missing’. Nevertheless, Irish gallantry did little to prevent Lamoricière and his poorly trained recruits being routed. 1862 carte de viste of Myles Walter Keogh, probably the best known of the pope’s Irishmen, in Union Army captain’s uniform. 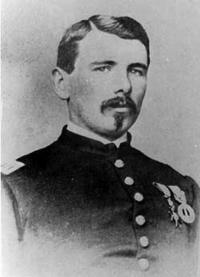 He later served with General Custer’s 7th Cavalry and was killed at the Battle of the Little Big Horn in 1876. After the surrender of Ancona, the Papal War of 1860 ended after just eighteen days, with between 70 and 100 Irish soldiers thought killed or wounded in action during those few weeks in September. Overall, the pope’s army received reasonable treatment from the victors, who were mindful that the eyes of the Catholic world were upon them. Three days after Ancona’s siege, the Irish enlisted men were separated from their officers, all destined for imprisonment in Genoa. The latter sailed on the ship Count Cavour, while the rank-and-file travelled overland. On arrival in Genoa, the Irish officers were kept in a large barracks but granted a parole d’honneur to visit the nearby town if they wished. Despite this relatively loose form of imprisonment, one rumour that troubled the Irish officers was that they were to be transported to Malta and ‘starved’ into the service of the British army. This never came to pass, however, and after three to four weeks of imprisonment the officers were released and the vast majority of the pope’s Irish battalion returned home. For their service, each officer and enlisted man was awarded a commemorative service medal—Medaglia di Pro Petri Sede—and all those who fought were declared ‘meritorious of the Catholic Church, the Holy See and all human society’. In further recognition of the Irish endeavours in battle, papal officials decided to form a Company of St Patrick to serve in the reorganised but greatly reduced papal army. Becoming part of the papal Zouaves, the Irish contingent never numbered more than 50, with Frank Russell retained as captain and the company’s initial commanding officer. The onset of the American Civil War a year later, however, prompted many of these papal soldiers to answer a second call to arms from Lincoln’s government, preferring the renewed thrill of battle over the mundane duties of Vatican service. Shortly after, the Company of St Patrick was disbanded and Irish involvement in protecting Rome, the repository of all that was sacred to the Catholic world, had ended. 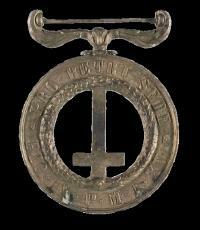 the Cross of the Order of St Gregory (for gallantry); right, the Medaglia di Pro Petri Sede (awarded to all officers and men who served). Note (in the detail, inset) the upside-down Cross of St Peter. Some of the men of the pope’s Irish battalion went on to have distinguished military careers, particularly in the Union ranks during the American Civil War. Patrick Clooney, who fought so doggedly in the streets of Perugia, died while rallying the men of the Irish Brigade at Antietam. Fellow Waterford man Dan Keily (Ancona) was horrifically wounded at Port Republic while leading a daring charge of Ohioan cavalry, and J.J. Coppinger (Spoleto) established himself as one of the Union army’s most redoubtable fighters, ending the war as a general. Probably the best known of the pope’s Irishmen was Myles Walter Keogh (Ancona), whose impressive service in the Union ranks gained him a post-war captain’s commission in the famed 7th Cavalry. Keogh was killed along with General Custer and 200 other troopers fighting Sioux and Cheyenne warriors at the iconic Battle of the Little Big Horn. Robert Doyle is a public health professional by necessity and a historian by vocation. C.A. Coulombe, The Pope’s Legion: the multinational fighting force that defended the Vatican (Basingstoke, 2008). G. Fitz-Hardinge Berkeley, The Irish Battalion in the papal army of 1860 (Dublin, 1929). I. Kenneally, Courage and conflict—forgotten stories of the Irish at war (Cork, 2009). D. Murphy, The Irish Brigades, 1685–2006: a gazetteer of Irish military service, past and present (Dublin, 2007).